Officials at NGO ‘Operation Save Noa,’ an organization set up to support one-year-old girl Noa Onaga who suffers of a severe case of dilated cardiomyopathy and needs to get an immediate heart transplant, held a press conference on Dec. 28th to announce that the fundraising is likely to soon reach the target of ¥320 million needed for the operation. Noa Onaga is getting ready for a heart transplant at Columbia University in the U.S. 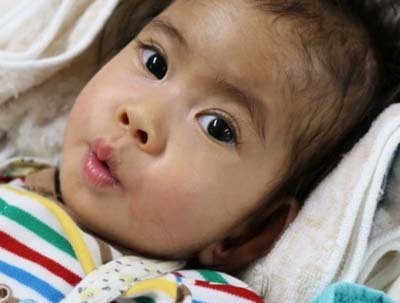 They thanked for the public for their support and help and announced that they will now cease the fundraising operations and concentrate on supporting Noa and her family as they are soon heading for the U.S. for the heart transplant operation. As of Dec. 28th, the effort had raised a total of about ¥304.33 million, and is expected to reach the target figure when not yet calculated funds in bank accounts and in collection boxes at locations on and off the island are settled. The organization has paid the deposit of $1.85 million to the Columbia University Hospital in the middle of this month. Hoping to travel to the U.S. in the middle of January, Noa and her family currently are carrying on procedures to obtain a visa for medical purposes, and preparing a medical jet to take Noa and her medical staff maintaining her mechanical heart that she now depends on.